So, you can see from the previous review, that I was recently on a road trip. Can't have a little mini home theatre in the car without some power. 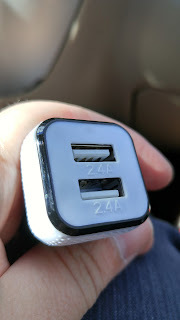 I have several little chargers, but was sent this one recently and thought it'd be a nice opportunity to review it. 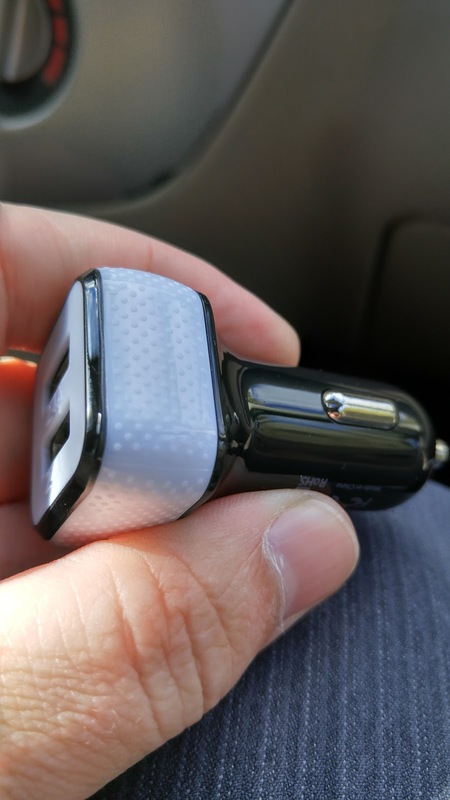 It's the Mokos Car Charger ($8.79USD). On the outset, it looks pretty much similar to anything else tout there. Sure there are some at 2A already, and some that have multiple outlets. This one only has 2 outlets, and they're both at the 2.4A level, I would have wanted more, but then you would find that some might be 1A; whereas with this you don't have to worry which is the faster option (note, it's still only 12W so it's not 'rapid charge'). What I ended up really liking about this device is the ... ridge is textured which provides you with a little grip when you want to pull it out. I didn't think much of it when I first saw it, but when I got into my friend's car his outlet is in a bit of a different spot (as you can see above), and another charger might have either been unable to fit in, or would have sat flush, meaning it could have been near impossible to remove. 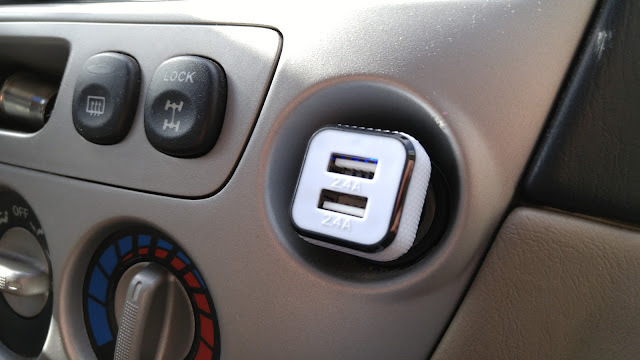 So, if you've got an oddly placed port in your console or just want to ensure that both items that get plugged in will ensure they get full charging, go for this!